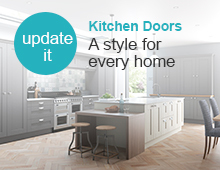 The Blum Tandembox drawer's sculpted profile adds interest and a timeless element to your kitchen furniture, complemented by a great range of accessories. 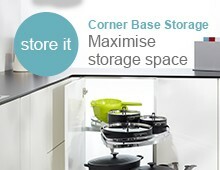 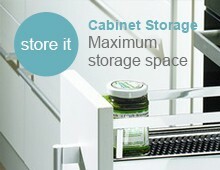 Designed to make full use of the 400mm cabinet width, each Blum Tandembox drawer provides maximum storage space. 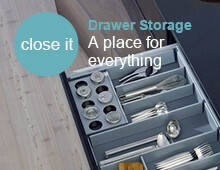 All the high quality features and performance you expect from Blum, including their smooth full extension opening and controlled soft closing drawer action. 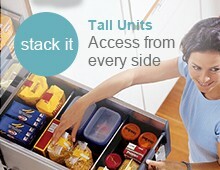 Each kit contains all the necessary components to quickly assemble your chosen size of drawer box. 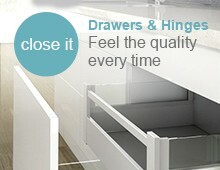 All you need to supply is your choice of drawer front.